At its Worldwide Developers Conference today, Apple launched its new Music service and new mobile software that takes on its top rival Google. But marketers interested in tapping Apple's potential treasure trove of music-related and mobile data should hold off on celebrating. All of Apple's new features are meant to wow users but none came with easy solutions for brands, according to industry experts. Part of the reason Apple's latest services are inhospitable to advertisers is because of how heavily it guards users' private information, the kind of data that Google and Facebook rely on to serve hyper-targeted ads. "We honestly just don't want to know [that much about users]," said Apple's Craig Federighi in one of several thinly veiled remarks referring to rivals Google and Facebook's practices of collecting personal information—a key issue for Apple of late. Still, Apple is coming up with ways for Apple Music to know what users want to listen to and when, and what news stories might appeal to them, leaving marketers wondering if that kind of technology could eventually help advertising on Apple devices. "Not sharing data is great for a user's experience," said Rye Clifton, product strategy director at the agency GSD&M. "But hopefully they figure out a way to anonymize all that data in a way that is still beneficial from a marketing standpoint." More generally, Apple showed off Music, new Siri search capabilities, a digital news platform, and upgrades to Notes and Maps. The company repeatedly emphasized that all the personalized features would rely on anonymized data that's not for sale to benefit marketing. Apple was light on ad capabilities in other areas, as well. For instance, Ryan Mclaughlin, chief strategy officer at Tribal Worldwide, said Apple's new publishing app featuring stylish story layouts from top media companies could be a "news-centric marketer's worst nightmare, at least for the short term." That's because of the questions regarding whether the same technology that personalizes the news selection could be used to target ads, something Apple seems reluctant to fully embrace. UPDATE: Publishers will keep 100 percent of ad sales they generate on their own in the News app, but Apple will take a 30 percent cut if it helps sell the ad. It's a similar model to Facebook's Instant Articles, the new-look stories that publishers can post and sell ads against on the social network. Jimmy Iovine, who just joined the company, helped unveil Apple Music, which is an immediate threat to the likes of Spotify. "Guys, can we build a bigger and better ecosystem with the elegance and simplicity that only Apple can do?" he asked. The service is "one complete thought around music." The idea was to incorporate all the album sales, videos and social networking crucial to today's music industry. Apple Music lets artists do it all from one hub. Apple Music launched with a nod to Apple's history of disrupting the industry when it first created iTunes and the iPod. Now, artists can share their music on the "biggest platform in the world that people already have," Iovine said. Indeed, with the popularity of the iPhone and the iPad, Apple Music debuts in prime position from the get-go. The service costs $9.99 a month for individuals, or $14.99 for families of up to six people, and gives them complete access to iTunes content on demand. "Can Apple beat Spotify? Yes, it can, not because its service will be any better, but because it can build its new music service into the hundreds of millions of devices that its loyal Apple users already love," said Forrester researcher James McQuivey in an email statement coinciding with the announcement. With artists and studios on board, Apple Music is seen as one of the best entry points to the iPhone for brands, according to Dominic Sandifer, president of Greenlight Media and Marketing. 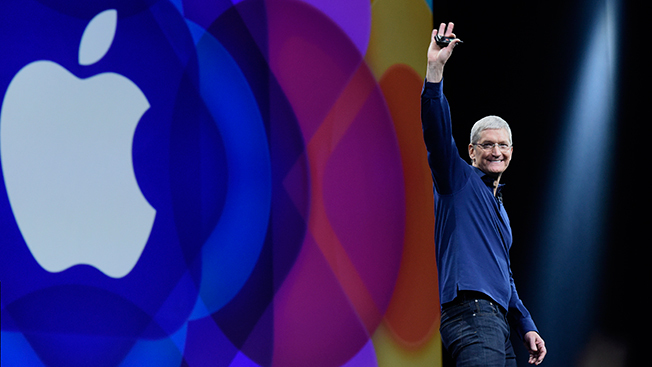 "Obviously, Apple is a massive player in the content space," Sandifer said. "News and music are important elements." Like so many new digital studios, Greenlight works with brands to produce content and connect them with the music industry. Apple Music has a heavy video component with a new social-media platform called Connect that lets artists share content with fans. These elements will help Apple differentiate itself from other subscription services like YouTube and Spotify, Sandifer said. Iovine said it will "change the way you experience music forever." Today's Worldwide Developers Conference also included upgrades to Apple Pay, Apple Watch and the release of iOS 9, its next generation of mobile software. With 1 million retailers in the U.S., Apple Pay is now headed to the U.K. and has 250,000 retailers on board there at launch. Apple also changed Passbook's name Wallet, and the payments platform now takes retailers' loyalty cards. Consumers can add cards from places like Dunkin' Donuts (a newcomer) and JCPenney to their accounts and then scan their phones to pay. Also, Apple Pay now works seamlessly with Pinterest's new Buyable Pins, so users can click pins and buy right in the app on iPhones and iPads, something that was first announced last week. This upgrade to Apple's mobile software looks an awful lot like Google Now, the search giant's next-generation software connecting users to all their daily habits like checking calendars, directions and apps. Apple now has a similar service and new software for developers to plug into its search functions. The voice-activated assistant Siri can search through everything from apps to reminders to music. The search can deep-link into apps like OpenTable, so users can go right to the reservation page of a restaurant without having to navigate from the app's front page. It also returns video search results from sites like YouTube, Video, Vevo and iTunes. Apple says Siri handles 1 billion requests a week. The new Maps finally includes directions for people walking or using public transit. Apple says it gets the most user requests for map services of any of its rivals—5 billion a week. Notes are also an important daily activity for iPhone users, and it now has a Pinterest-like function that lets people save items they come across online for future reference. The Notes presentation features Delta faucets as an example of the type of content that users would put on their to-do lists. Another major announcement from Apple was its latest attempt at changing the publishing landscape. Apple News, an iteration of previous services like Newsstand, puts digital articles with interactive photos and stylish videos into stories from top publishers like The New York Times, Wired and ESPN. It was clearly designed as an alternative to Facebook's Instant Articles and apps like Flipboard.